By 1971, The Allman Brothers Band were feeling the first blushes of success after having released two studio albums that went nowhere and a live album recorded at The Fillmore which broke the band big. As a result, several members of the band including Duane Allman and Berry Oakley found themselves very rich and very addicted to heroin. The band began recording their next studio album cutting tracks for “Blue Sky,” “Stand Back” and “Little Martha” at Criteria Studios in Florida before a stint in rehab became necessary for Berry, Allman and a few of the group’s roadies. Unfortunately, tragedy struck the day after Allman checked himself out of rehab on October 29th, 1971 when he was involved in a fatal motorcycle accident back home in Macon, Georgia. 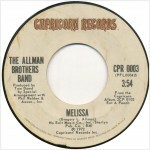 Not only did Allman’s death call the new record into question, but the fate of group’s survival also became questionable. The band decided to carry on by doing what they did best, heading back out on the road. During the stint on the road, Dickie Betts took on the role of lead guitarist and group leader before the group headed back into the studio in December of 1971 to finish work on their next album. The album, Eat A Peach was a double that was half studio recordings and half live recordings featuring the last recorded performances of Duane Allman. The album also included both songs from today’s jukebox single. 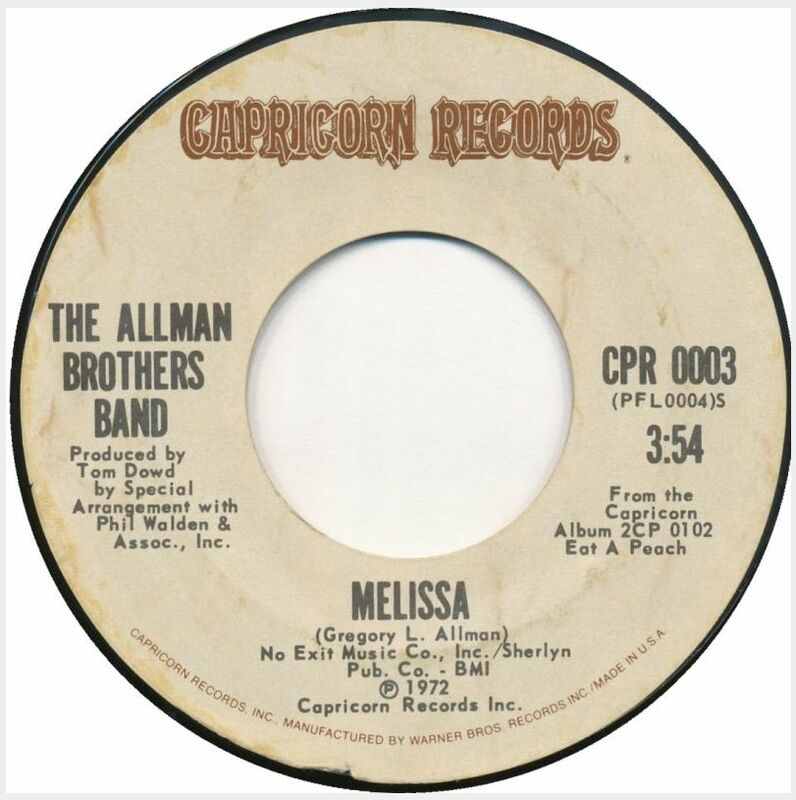 “Melissa” was originally recorded in 1968 by one of Gregg and Duane’s early bands called 31st Of February (which also included Butch Trucks, Scott Boyer and David Brown). Their demo recording featured Duane’s first use of bottleneck slide guitar on record, however after committing it to tape; Gregg sold the rights to the song to producer Steve Alaimo for $250, the price for an airline ticket from Los Angeles back home to Macon, Georgia. The song was performed by Gregg at Duane’s funeral since it was one of Duane’s favorite songs. 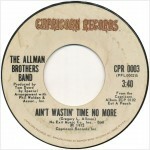 It was also one of the first songs recorded by The Allman Brothers Band after Duane’s death. The group’s manager, Phil Walden ultimately bought back the rights to the song before the group committed it to tape for Eat A Peach. 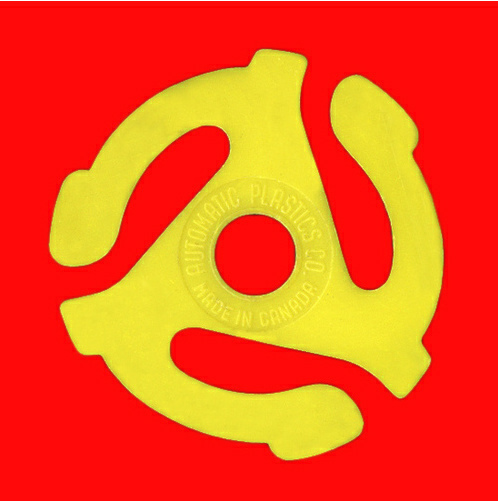 The flip of today’s single is the reason it was chosen for the jukebox. “Ain’t Wastin’ Time No More” is the consummate southern rocker and the opening track to the Eat A Peach album. The music was composed by Gregg Allman before his brother’s accident, while the lyrics, dealing with Duane’s passing and veterans coming home from the Vietnam War, were written immediately following his death. Much of the song was composed on a 110-year-old Steinway piano in Studio D of Criteria Studios in Miami, Florida. The Eat A Peach album ultimately rose to the #4 position on the album charts upon its release in 1972. 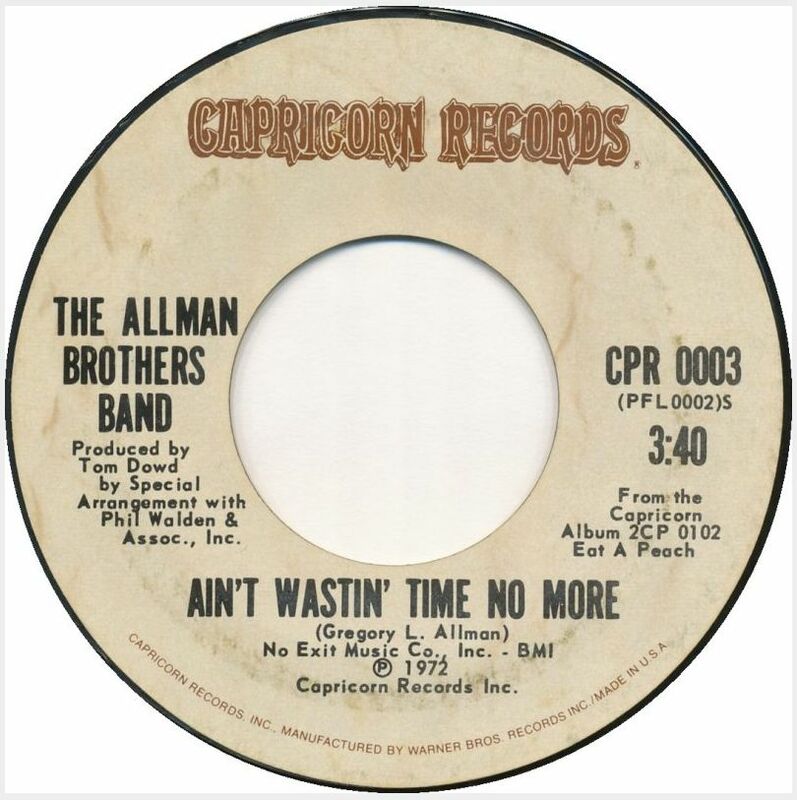 The Allman Brothers Band lineup at the time was the classic lineup of Duane Allman on guitar, Dickie Betts on lead guitar, Gregg Allman on vocals and piano, Berry Oakley on bass, Jai Johanny Johanson on drums and Butch Truck on drums. Today, The Allman Brothers Band still exist and still perform their annual residency at The Beacon Theater in New York City. However, this year Greg Allman dropped out of the last few shows due to illness. #100! “The Jukebox Series” focused on the 80 records that currently inhabit my 1963 Seeburg LPC1 jukebox. I’ve had my jukebox (or as I like to call it “the prehistoric iPod”) for a little over twelve years and in that time I’d like to think that I’ve perfected the mix of 45s within. Over the years, records have come and gone out of the ranks of the juke, but they were all at one time juke-worthy. I’ve decided to expand “The Jukebox Series” to include many of the “juke-worthy” records that are no longer currently in the mix, but at one time inhabited a coveted slot.